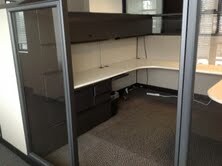 Knoll Dividends workstations in 6×6 or 6×8 configuration. Overhead storage consists of two reuter style bins and under the worksurface storage consists of a BBF and FF pedestal. There is a wardrobe storage cabinet in each station as well. Some of the panels have glass accent.